I admit I lead a pretty charmed life. I get to do work I love, surrounded by a family I adore, supported by incredible friends and a community that's always felt like home. And I've got a pretty neat dog. And in between all this fun, I get to hang out in some really cool places, with some really cool people. For example, this place. 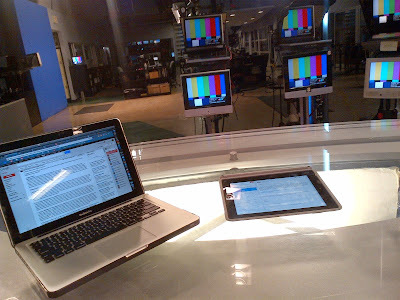 The picture is taken from the anchor's chair at CTV London. If you're wondering what it looks like to deliver the evening news, this is it. Don't worry: I'm not about to become an anchor (pity London viewers if I ever do!) But I drop into this remarkable place often enough that every once in a while I get to do an interview from this location instead of the secondary studio that's way down the hall just right-of-center of this shot. And when I do anything on-air, my laptop and iPad, like high-tech security blankets, are never too far away. I don't actually use them when the red light goes on. But finalizing my notes in the few minutes before we go live, and knowing they're nearby, is often all that I need to feel just right as the conversation gets underway. There are so many moving parts to doing an interview that sometimes it just makes sense for me to sit in the big chair, where I get to follow in some very big, very accomplished footsteps. While it looks a little terrifying at first glance, the reality is that this place has become something of a second home to me, and it's easy to do what I do when I'm surrounded by the best in the business. Your turn: Is there one place on the planet that frightens you? What is it, and why? Would you recognize a stroke? Can I have a lift to choir practice? Learning a life lesson from...noodles?